What is NAT and PAT and why to use them? Network Address Translation (NAT) in its most simple form is a method of translating a one IP address to another. For example a public IP address is translated to a private IP address and vice versa. Without NAT computers on private networks would be unable to reach any Internet resources as private IP addresses are not routable on the Internet. Hence the creation of NAT. Port Address Translation (PAT) on the other hand uses a single outside public address and maps multiple inside addresses to it using different port numbers. Both are extremely common and useful for establishing Internet connectivity and providing access from the Internet to systems on private networks. In the network below there is a single router, one end-user computer, and two servers. We will be performing a total of three configurations: a NAT for computers to access the Internet using a single public IP address, a static one to one NAT translating all traffic from 1.1.1.2 to 10.1.0.2, and a PAT translating 1.1.1.1:2323 to 10.1.0.3:23. These configurations will provide Internet connectivity and make remote services accessible on the Internet. 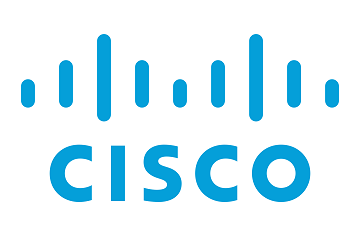 However, it is important to understand when a static one to one NAT is configured without any additional access list filtering traffic or ports the device is essentially directly connected to the Internet. Step 1: Configure all applicable router interfaces. We are also going to assign a secondary IP address on FastEthernet0/0 which will be used later in one of the NAT configurations. Step 2: Configure each interface as either an outside or inside NAT interface. Step 4: Configure a access list to specify which networks are allowed to make use of the NAT. End the access-list with a deny statement to ensure any traffic that is not matched is dropped. 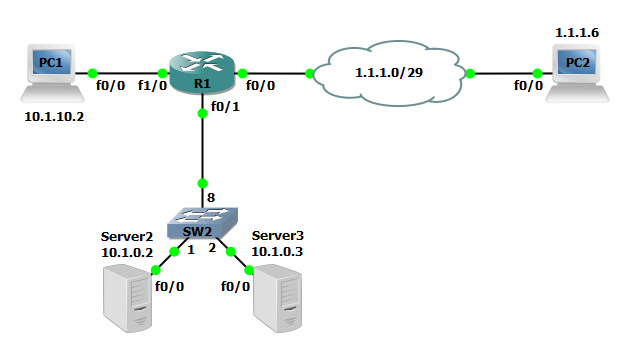 Step 5: Configure a one to one NAT translating 1.1.1.2 to to 10.1.0.2. Caution: when a static one to one NAT is configured without any additional access list filtering traffic or ports the device is essentially directly connected to the Internet. If the device does not have a firewall the device is unprotected and vulnerable. Step 6: Configure a PAT translating 1.1.1.1 port 2323 to 10.1.0.3 port 23. Now that the configuration is finished lets verify remote connectivity. Using the ping command you can verify the inside addresses will no longer respond. 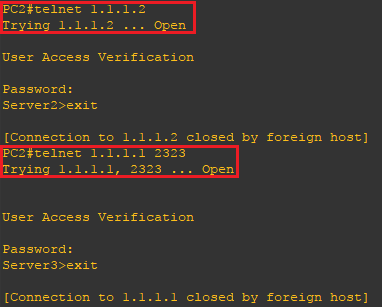 Use the telnet command to verify connectivity to Server2 and Server3. The Server3 device will only response to telnet request when using the defined port we are translating from the outside to the inside device.